Are you looking for a great city to explore with your family? Why not take a road trip and mini vacation in Chicago? You can squeeze so much fun into just a few days…and if you have an entire week to spend then your possibilities are endless! We wanted to take a family vacation for Spring Break that didn’t require a very long drive or a flight to our destination. At just about five hours away, Chicago was the perfect destination. Even with pouring rain the day we left we still made great time and the drive was relatively easy. 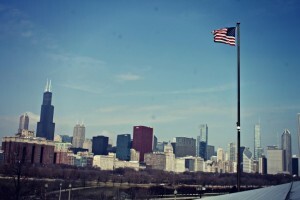 I am going to share with you what we did on our trip to the Windy City for Spring Break. We didn’t make it to every place we wanted to because our trip was only four days long, but I feel like that just leaves us more to do next time we go! We squeezed as much as we could into our four days and had a blast! Here’s a bit about our trip to help you plan your own trip to Chicago! I spent quite a bit of time researching our trip before we went. 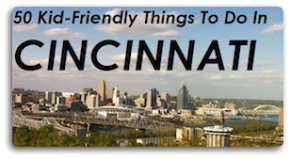 I asked for recommendations from friends and from the Family Friendly Cincy readers for things to do and see and places to dine. So before we even left I had armed myself with lists of things to do while we were in the city. There is an overwhelming amount of family friendly things to do in Chicago, so making a list ahead of time of places we really wanted to go helped out tremendously. I made sure to schedule some “downtime” in our day too, so we could rest. The kids are young and seem to have boundless energy, but they needed to recharge their batteries each day because we were doing a lot of walking and exploring in Chicago. Before we left I also researched prices of attractions, and was pleased to find that we had reciprocity at several museums because of our Cincinnati Museum Center pass! That was an added bonus, knowing that we’d get to visit some awesome museums for FREE. That fact also helped me figure out our accommodations. I was willing to splurge on a nice hotel room since we would be saving money at Museums during our visit. We decided to get a suite at the Embassy Suites Hotel downtown, and it was perfect for our family. The kids slept in the bedroom of the suite, which had two double beds, and then Michael and I took the pull out sofa in the living room. The suite also had a refrigerator and microwave so we can keep food in our room. And our view of downtown from our 17th floor windows was gorgeous! The Embassy Suites also offers a FREE breakfast buffet, which was like hitting the jackpot when you are feeding six people! The hotel also had a complimentary happy hour each evening for two hours….which was lovely after playing the part of tourists for hours each day with four kids, it was nice to come “home” to a complimentary cocktail. The ES hotel was right downtown on State Street, so we were right in the hustle and bustle of things. We were able to walk to many restaurants, shops and even to Navy Pier. The hotel was huge, and beautiful and we really enjoyed our stay there. I had flirted with the idea of staying outside of town to save money, but looking back I think that would have really ended up being a pain getting around town. Visit the Embassy Suites Downtown Chicago website for more details about the hotel. As I mentioned before, breakfast was included with our stay at the hotel, so that just left us on our own for lunch and dinner. We had lunch each day at Museums, which may have been more expensive than a run of the mill fast food joint, but the food was better, and it was nice to grab a quick bite and then keep sightseeing. For dinner we visited local restaurants that were recommended to us. Two of the restaurants we dined at were fabulous. 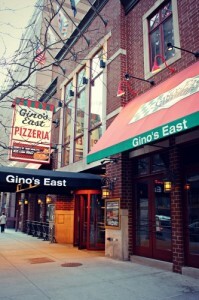 Being in Chicago, I felt that we simply HAD to have some deep dish pizza, so we took the recommendation of friends and FFC readers and went to Gino’s East Pizzeria. It was the perfect deep dish pizza experience…it was delicious! We also had dinner at Flo & Santos, a neighborhood tavern that is known for their pizza and Polish dishes. This was my favorite meal in Chicago, the menu had a lot to offer, and the food was great. And for snacking we made several stops at Garrett’s Popcorn (several locations around town). Our family LOVES popcorn, and Garrett’s gourmet popcorn and even their plain ol’ buttered popcorn is AMAZING. If any of you go to Chicago for a trip feel free to bring me a bag back. Chicago’s Michigan Avenue is renowned for it’s offerings of stores for your shopping pleasure, and it’s certainly an interesting activity to walk down the Magnificent Mile. There are beautiful buildings to look at, interesting people all walking together, and a little bit of history as well. Of course our walk on the Magnificent Mile was very focused. Ella was intent on getting to the American Girl Store, which is located at the famous Water Tower Place. The American Girl Place has two floors of clothes, accessories and furniture to choose from, as well as a hair salon for the dolls, a Bistro for dining with your Doll and a photo studio! To say Ella was in heaven would be an understatement! The boys endured the trip to American Girl Place, but only because I promised them a trip to the HUGE Lego store that was right next to the American Girl store. So in the end everyone was a happy camper. The John G. Shedd Aquarium in Chicago is home to more than 32,000 sea creatures and animals. Visiting the aquarium can be an all day affair because there’s just so much sea-life to witness! The exhibits are You can feel like you are in the Amazon one minute and visiting a Caribbean Reef the next. There are river exhibits, ocean exhibits, lake exhibits and more! And right now they have a pretty cool Jellyfish exhibit going on where you can get right up close and personal with these beautiful creatures. It’s not just sea life displays at the aquarium, there’s also an awesome play area for kids, the Polar Play Zone, where they can touch starfish, pretend they are penguins and watch otters swim. You can also catch one of their spectacular Aquatic Shows and see the animals show their stuff, which I highly recommend. And if you have any questions about any of the fish or animals you see just ask one of the employees, they all seems to have a wealth of knowledge about the animals they are working for. In fact, one thing I really liked about the Shedd Aquarium is their respect for aquatic life and how well they treat all of the living beings they work with, we learned a lot about the training and care of the animals during the show we attended. The other thing that I loved about the Aquarium was the architecture. It is such a cool old building, it was built to look like a temple, and has touches of sea-life everywhere you look, turtles on the ceiling, marine fossils on the floor, a sea creature clock and more. Look around at the building, not just the fish if you go to the Shedd Aquarium. The building itself is an exhibit not to be missed if you ask me. If you plan to go to Shedd I would definitely recommend that you plan to spend most of a day there. That’s what we did..we walked around for hours, spent time in the play area for kids, watched the show, walked around some more and even grabbed lunch. They have three great dining areas with a great selection of food to choose from. You can find more information on the Shedd Aquarium Website. ***Disclaimer: My family was given complimentary passes to the Shedd Aquarium but the opinions are all 100% my own. Do you have a membership to the Cincinnati Museum Center? Then you won’t want to skip a trip to the Field Museum if you are visiting Chicago because your visit will be FREE! That’s right, the Field Museum is one of several museums in Chicago that offers reciprocity for CMC members. As a mom of four, I found this to be a great deal for our trip. The only mistake we made with our trip to the Field Museum was not planning enough time to explore it. We just had a few short hours to wander around and we did not make it to nearly enough exhibits, so if you are heading to the Field Museum plan to make a day of it. There are many great permanent exhibits in the museum such as the Africa exhibit, the Ancient Egypt section, the Hall of Native North Americans, The Ancient Americas, and then there’s the centerpiece of the museum: Sue, which according to the Field Museum website is the largest, most complete, and best preserved Tyrannosaurus rex ever found. And that’s just to name SOME of the permanent exhibits. There are even more! And on top of that they have special temporary exhibits, such as the “Wonder’s of the 1893 World’s Fair” exhibit that is there until September 7, 2014. Visit the Field Museum Website for all the important details you need to plan your visit. I don’t really know where to start when describing Navy Pier because there’s really just so much to do and see here! There’s the Children’s Museum, a multitude of restaurants, shops, a Stained Glass Window Museum (see below), rides, bike rentals, shows, sightseeing cruises, a movie theater, gardens and MORE. Seriously, this place has something for everyone, and you could easily spend an entire day being entertained at the Navy Pier. Check the Navy Pier website for more details on what they have to offer as well as to visit their Events Calendar, there always seems to be something fun going on! 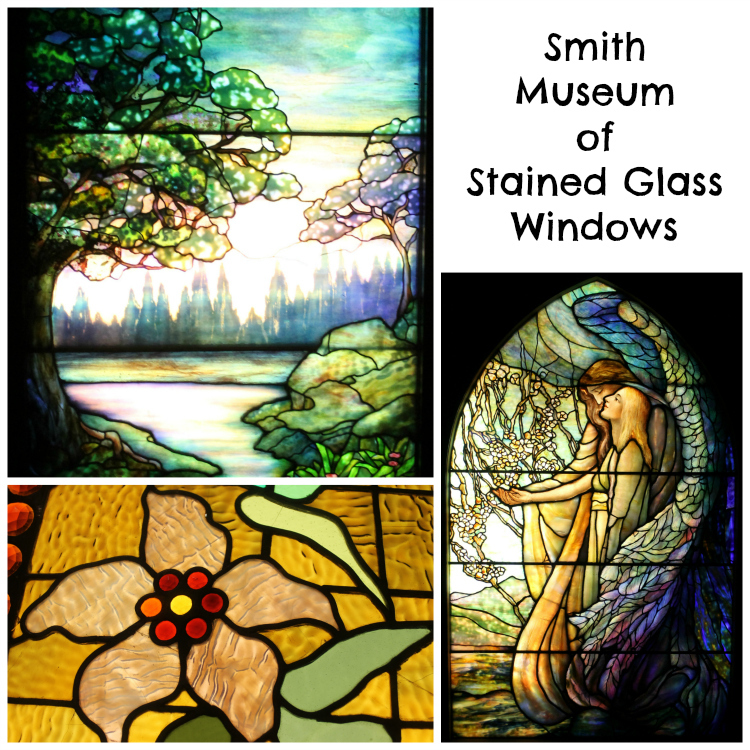 Located at Navy Pier, this Smith Museum of Stained Glass is one of a kind displaying 150 stained glass windows. It was awe-inspiring to visit this museum and see these beautiful works of art up close. According to the Museum’s website “all of the windows were designed by prominent local, national and European studios and most were originally installed in Chicago area residential, commercial and religious buildings”. There are numerous windows made by Louis Comfort Tiffany and John LaFarge, who are both well known for their stained glass artistry. The museum was quite an experience, even my three wild energetic boys were actually very calm and peaceful while we walked through and they were intrigued with the windows. It is the only Stained Glass Window Museum in the country, and is open and free to the public whenever Navy Pier is open. The Museum of Science & Industry is not just for the science buffs, believe me, as I’m not that interested in science in general (except to be appreciative of everything science as done to make my life better). When planning our trip to Chicago I planned our excursion to the Museum of Science & Industry with my children and husband in mind, as their interest in science is greater than mine. Imagine my surprise when I was just as happy as them to wander about this museum. I learned so much! I love how they had so many hands-on experiences and life-size displays. One of the things there that I found to be the best learning experience for our family was the Jet in the aviation area where you could actually enter the plane, sit in the seats, see the engines and go in the cockpit. My husband was able to give our kids a much clearer picture of what he does at work each day (he works at GE). That was very cool! We spent a day at the Museum of Science & Industry and still did not get to every exhibit, there’s just way too much to see and do here! And as an added bonus, the Museum of Science & Industry also has reciprocity with the Cincinnati Museum Center, so general admission was free! We did pay extra to visit the Disney exhibit that was there at the time. Visit the Museum of Science & Industry Website for information about planning your own visit. The one regret I have about our trip to Chicago is that I opted out of the trip to the Art Institute, feeling like perhaps the boys needed some outside time after all of our museum time. So Michael took Ella to the Art Institute and I took the boys to Navy Pier and the Zoo for the day. Ella and Michael had so much fun (all of the pictures above were taken by Ella). She loved seeing the great works of art in person, and her excited chatter about American Gothic, Van Gogh, cool sculptures and details about every single thing she saw made me wish I had been there too. 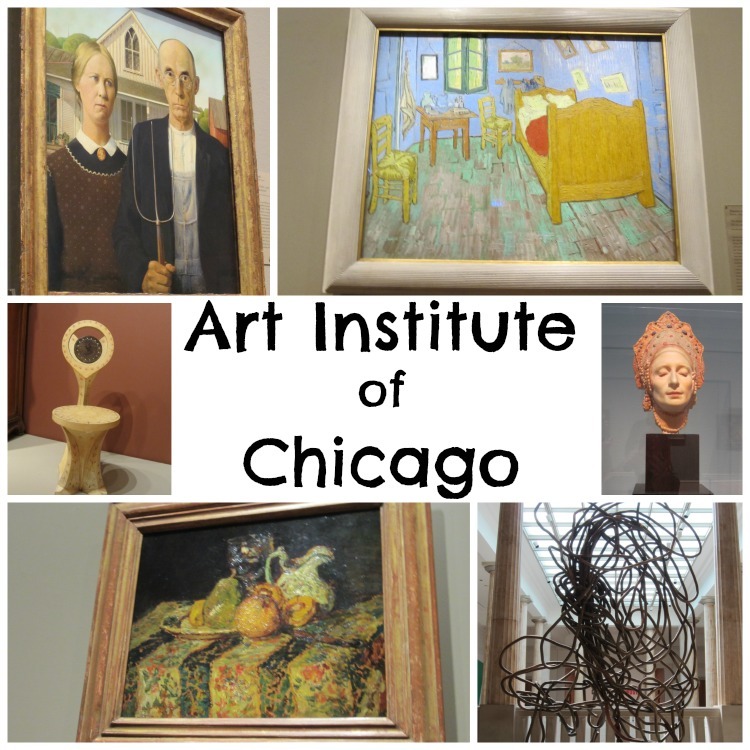 There are over 300,000 works of art at the Art Institute in eight different buildings, so again, this is another place you could spend all day visiting. For more information visit the Art Institute of Chicago’s Website. 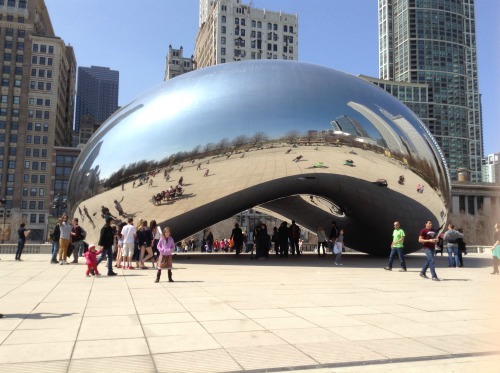 Millennium Park is home to beautiful landscaping, larger than life sculptures (such as the renowned “Cloud Gate” seen above), events, concerts and more. Since the park is across the street from Art Institute Michael and Ella picnicked at the park during their trip to the Art Institute. They ate lunch, visited “the Bean” and did a little geocaching before heading back inside to look at more masterpieces. The boys and I went to Lincoln Park Zoo on beautiful sunny day and wandered around for a few hours. It’s a really cool zoo in the middle of Lincoln Park, on the shores of Lake Michigan. And best of all…it’s FREE to all! The zoo runs on money made at the gift shops, concessions, fundraising events, and donations. There are animals to visit, places to eat lunch, a play area for kids, and in the warmer months you can even attend concerts, yoga and adult’s evenings out at the zoo. There seems to be a lot going on at this zoo! The Lincoln Park Zoo website has all the information you need to plan a visit. There you have it, our trip to Chicago in a nutshell. I felt like we had a great vacation in just a few short days, but I know we missed other great attractions, so I’ve already started a list of things to do next time we go! Feel free to comment below if you have ideas for what we can do next time we go! Get a great view of the Windy City from 360 Chicago (formerly John Hancock Observatory) or from atop the Skydeck Chicago. Go to the Theatre – Broadway here I come!